With the right ingredients, smoothies are great post workout way to refuel and kick start recovery and repair muscle. Similarly, smoothies can promote healing after surgery. I practically lived on homemade smoothies after my tummy tuck surgery (abdominoplasty) because I had little appetite for whole foods and needed a way to push nutrition. As grueling as it can be, the blissful results achieved from body contouring plastic surgery is what keeps me pushing through my recovery. But if I fail to eat the right nutrients after surgery, healing and recovery can be delayed and ultimately can negatively impact the way my body will look in the end. Blend all ingredients in an electric blender until smooth. Makes one large smoothie that is not too thick. For a more shake-like smoothie reduce the ice cubes to three and the watermelon to ¾ cup. What Makes this a Recovery Drink? Surgery is particularly stressful as incisions are created and the body works to heal its wounds. According to Jon B. Turk, M.D., a facial plastic surgeon, research has demonstrated that optimal recovery, including the best possible results seen in the shortest time period, is achieved when particular dietary and supplement regimens are followed. Specific nutrients are needed to repair skin, blood vessels, nerves, and even muscles and bones. To repair and rebuild your body, post-surgery recovery requires amino acids, which are the building blocks of lean tissue. Amino acids are found in protein and dairy or can be taken as supplements such as glutamine powder. I am not a nutritionist so for best results check with your healthcare professional. I used Trader's Point Creamery European Style Yogurt wildberry flavor, from a dairy farm that is local to my city. As much as possible, I buy my food from local farms and stay away from big box grocers because the food is so much more nutritious and healthful. Trader's Point Creamery whole milk yogurt is made from whole creamline milk and live active cultures. 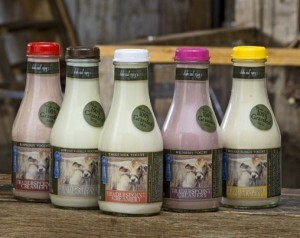 It is a drinkable yogurt that can be sweeten with real maple syrup, raw honey or fruit. But I often drink it just plain. Trader's Point Creamery four fruit-flavored yogurts are flavored with only high quality fruit purees, and sweetened with a touch of organic cane juice. I used Wildberry flavor in this recovery smoothie recipe. I also make a recovery smoothie using Banana Mango flavor yogurt and pineapple or mango for the fruit. Trader's Point Creamery does not use any stabilizers in their yogurts, so it is of a thinner consistency perfect for drinking. Compare this to the processed-food yogurt that you can get from the supermarket, and you will see there is no comparison in quality or taste. Raw honey has anti-viral, anti-bacterial, and anti-fungal properties. It promotes body and digestive health, is a powerful antioxidant, supports the immune system, and is a remedy for skin wounds and many types of infections. Chia seeds are high in fiber and gluten-free (I have celiac disease). Chia seeds are one of the super foods are bursting with omega-3 and omega-6 essential fatty acids, fiber, and B vitamins, and contain protein and calcium. "Chia" comes from the Mayan word for "strength" and reportedly chia seeds were used as an endurance food. Learn more in David Mendosa's article on Chia Seeds. Glutamine is the most abundant amino acid (building block of protein) in the body. The body can make enough glutamine for its regular needs, but during extreme stress (the kind you would experience after very heavy exercise or surgery), your body may need more glutamine than it can make. Increased tissue concentrations of this amino acid will reduce healing time and aid in surgery recovery. Clinical studies have found that glutamine supplements strengthen the immune system and reduce infections (particularly infections associated with surgery). I used Body Fortress Whey Protein because it has a high concentration of amino acids. It offers 9 essential amino acids and 9 non-essential amino acids and offers over 8 grams of BCAAs. Branched Chained Amino Acids are three amino acids - Leucine, Isoleucine, and Valine -- with similar structures that beneficially influence muscle cell growth and body composition. Fiber powder in the grit-free, taste-free, non-thickening form is a great addition to recovery smoothies and will help prevent constipation, which is common after anesthesia and pain-killing narcotic prescription medications. Two brands that I use are Metamucil Free & Clear and Grit-free Benefiber.